Architectural slide gates are available in a cantilevered slide, overhead track or ground track system. All PalmSHIELD slide gates are constructed using our engineered gate design successful in supporting the gate without exception. We use proven engineering principles in properly trussing our gates in consideration of both gravity and wind loads. Once we are satisfied with the engineered framework, we design our PalmSHIELD signature framed panels to fit into the gate structure. 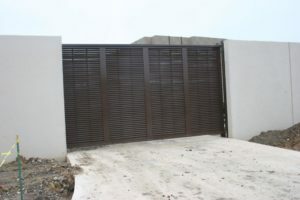 Panels may consist of our horizontal louvers, vertical louvers, diagonal louvers or solid architectural screening. Our gates are designed to blend perfectly into our screen systems. Add an architectural slide gate into your mechanical equipment enclosure for ease of use, best use of space and those situations when a swing gate just will not do.